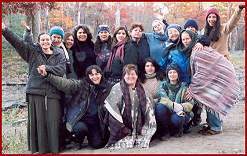 In the late fall, M.J. and Myrriah Lavin travelled to the 55-acre homestead in the rolling Catskill Mountains of New York that is both the Wise Woman Center and Weed's home. Weed's warm, welcoming kitchen is lined with shelves filled with pots, bottles, jars, and packets of her herbal remedies and medicines. Outside, the geese and goats ranged over the shards of blue shale indigenous to the region. We interviewed Weed, a powerful and charismatic speaker, while she and her household unloaded bales of hay on this brisk but sunny autumn day. OBS: How did you come to use the term "green witch?" SSW: I bought this property in 1978 and we were sitting there by the pond, talking about witches and being witches and what was going on in politics. Even in 1978, it was starting to look like it was going to get more and more repressive. We were talking about the Burning Times and we said that the way to head off another burning times is to start being public now. And we need some kind of catchy slogan. We tossed around a bunch of different things that afternoon. Finally, in the end, we said that what really sums it up--what we will really tell people about witches--is witches heal. And that has gone on to be quite the slogan of the movement these past twenty years--to really let people know that witches are not about flying through the air on broomsticks or causing men's penises to become detached from their bodies and go flying through the night impregnating wanton women. How's that for an excuse? Witches basically were women--some men--who healed without a license. That was a legal definition of a witch for the 300 years of the Inquisition--a person who healed without a license. So, we left off the "without a license" part, which, of course, is true of me and many, many other witches. The catch-22 then was that women were not allowed to go to medical school, so there was no possibility that women could heal with a license. It was simply closed, barred, not allowed of her at all. And in a way that is very difficult for us to grasp from our modern understanding, it was further thought that any women who helped a woman in childbirth and helped her to stay alive through childbirth was the agent of the devil. The Bible says that women are to suffer great pain in childbirth, and the Catholic Church at that time said that women do not have souls. The only way that a woman could be redeemed and get to heaven was to die giving birth to a child. The Catholic Church was the political as well as the religious power throughout Europe, and so any woman who knew about birth control, any woman who helped women to miscarry, any woman who helped women to give birth to live young was an agent of the devil by definition. Those women were then called witches and were burned for healing. So we proposed that we would be very vocal about being witches and that we would use this political slogan--"witches heal"--and really put that out there. Of course, the response I got back from people was "Are you a white witch or a black witch?" And I said, [looking at her skin] "This time it looks white, but is that really what you mean?" They would say, "Oh no, that's not really... Really what I mean is, are you a good witch or a bad witch?" And I'd say, "Since when is good white and bad black? Isn't that the kind of racism that is screwing up our world and our relationships with each other?" To posit that black is bad, how are we going to see a black person and not immediately decide they are bad? Our culture feeds into that. We are all fed white supremacy. Even if we say, "I don't have any prejudice," we live, breathe, eat, and sleep white supremacy, and a lot of it is done in non-obvious ways. I grew up in Dallas (Texas) in the '50s, and I can tell you about obvious ways of expressing racism: like segregated public drinking water fountains where white folks throw chewing gum and cigarette butts into the "colored" drinking water fountains. Racism in the New Age doesn't spit in the drinking fountain, it oozes over our mental attitudes: white symbolizes pure and good, while black symbolizes bad and nasty. We seek the light, and try to get rid of the dark, black, negative stuff. And we delude ourselves if we refuse to believe that these attitudes influence how we deal with people whose skin is black. But that's the long answer. The short answer is: "I'm neither a white witch nor a black witch, I'm a Ôgreen' witch." And since we live in a world of "sound bites," where ideas can't be more complex than two words, I can shorten it even further: "Witches Heal!" "Green Witch, Green Goddess" and "Eat Weeds." OBS: How did you get from Dallas to here? SSW: By way of Los Angeles--UCLA. I was sitting in chemistry lab and my lab partner, Phoebe Macaffey, said to me, "What are you doing in high school? You're bored out of your gourd." And I said "You're so right, Phoebe, but what else is there to do?" She said, "Go to college." I said, "College? I'm only 15." She said, "Sure, you're smart enough. Just take the exams." So I took the SATs. I was in the 99.9th percentile, and basically it was a choice between MIT and UCLA. MIT said my chemistry was weak, because, of course, I spent my whole chemistry lab talking to Phoebe, and I said to myself, "Aah, who needs chemistry anyhow? (The universe is always full of those kinds of ironies.) Even though I'm a math major, maybe I should get a liberal arts education. I'll go to UCLA." So I did, and I got such a liberal arts education that I heard about LSD and decided that I really wanted to try it out. So I left college and moved to New York City. People sometimes look at me quizzically and say: "You moved from California to New York looking for LSD? Wasn't it all on the West Coast?" Actually, no. This was the early '60s, when LSD was still legal, and Timothy Leary and Richard Alpert (now Ram Dass) were on the "East" coast. The scene was at Millbrook, not San Francisco. Of course, it wasn't easy to get into that scene; this was before LSD was plentiful, but eventually, I did connect with someone who knew someone who had access. OBS: What did you think of it? SSW: I loved it! I wanted to do it again. I understood that this was my path to "enlightenment," to understanding in my body what I had heretofore only understood with my mind. I've been told that this should be considered a "short cut" or "too fast" and therefore discredited as a magical or spiritual path. But I consider this appropriate for our times. If I want to visit my sister in Texas, I don't walk there at 4 mph, I don't even drive there at 65 mph, I fly there at 300 mph. It is the quality of attention that I give to the trip that influences how magical or spiritual it will be, not how slowly or quickly I make the trip. This is a sample of Susun Weed's interview from Obsidian's Issue No. 3. 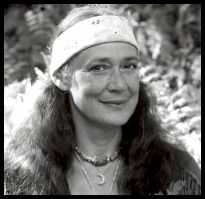 Wise woman, green witch, teacher, and author, Susun S. Weed is the founder and director of the Wise Woman Teaching Center near Woodstock, New York. An initiate of Dianic Wicca and member of the Wolf Clan, Weed teaches the Wise Woman Tradition of healing using simple herbs, tales of wisdom, and a keen knowledge of the ways of the Earth. Her books include Wise Woman Herbal for the Childbearing Year, Healing Wise, Menopausal Years, The Wise Woman Way, and her most recent book, Breast Cancer? Breast Health! 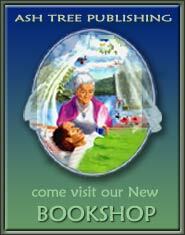 Moon Rites is designed to be used as a tool to enhance your self-knowledge, acceptance, and personal power. It is divided into three sections. The following is a rundown on what's in it and how you can use it. Empower yourself to make positive life choices.